Holden Roberto, the life-long rebel leader who has died aged 84 from cardiac arrest, was one of the fathers of <?xml:namespace prefix = st1 />Angola's independence. He was reputed to have organised the first insurgency against the inhumane rule of the colonial Portuguese government. In 1956, Mr Roberto with Barros Necaca founded the Union of Peoples of Northern Angola. The movement was soon renamed the Union of Peoples of Angola and later the National Front for the Liberation of Angola (FNLA). To many who encountered him, Mr Roberto was a hard, introverted and straight-talking man who cut a sinister figure under his beloved dark glasses worn even in dark rooms or on a cloudy day. time overseas than many of his fellow rebel leaders. The critics had a point; his Portuguese was weaker than his English and French. Alvaro Holden Roberto was born in 1923 in Sao Salvador, now known as Mbanza Congo. His father was a Baptist priest in a country that is overwhelmingly Catholic. In 1941, his family moved to Belgian Congo, where the young Roberto had his education. Since native Africans were denied university education, after school, Roberto became a finance clerk for the Imperial Belgian government in Kinshasa. He had a life-changing experience on a visit to Angola in 1951 when he saw Portuguese officials abusing an old African man. Mr Roberto later said that this spectacle spurred him into seeking a career in politics. Ten years later, in March 1961, the fiery-tongued Mr Roberto led his men on the first major military offensive against colonial rule in Angola. About a thousand Portuguese died as well as 20,000 Africans. The same year he also met with President John Kennedy at the White House to discuss further support and the protection of United States' interest in Southern Africa. He was reported to have been put on an annual salary of $10,000 by the US Government. The following year in 1962, a merger with the rival Democratic Party of Angola led to the formation of FNLA, of which Mr Roberto became the leader until an attempted overthrow in 1966 prompted him to return to the Congo, where he started a property business. As the Cold War was playing out in Africa and with the American government along with its Western allies having aided the assassination of Patrice Lumumba, Congo's much-beloved leader, Mr Roberto began received financial and military boost from Mobutu Seze Seko, the new Congolese leader and dictator, who was his brother-in-law. During the years of Angola's struggle for independence, he became the leading opponent of the Portuguese. But many journalists found the FNLA chief a reluctant interviewee and some said he was very arrogant. In 1964, Jonas Savimbi, one of Mr Roberto's leading men severed ties with FNLA to form his own rebel group, UNITA. Savimbi made his announcement at an Organisation For African Unity (now African Union) meeting in Cairo, Egypt. Savimbi, then the FNLA Foreign Minister, accused Mr. Roberto of "flagrant tribalism," and corruption. He alleged that Mr. Roberto had set up a "commercial empire in the Congo" (now Zaire) and that FNLA administrators were "wage earners and profiteers who enriched themselves on the money of New York financial circles and other international organizations." He also said that the group was not keen on spreading the insurgency outside its main base in Northern Angola. While the FNLA was losing men on the war front, within two years, Savimbi built up his first meager, 12-man force into a sizeable army, gaining popularity and support as the only leader to work within the country alongside his men in battle against the Portuguese. "Leaders must fight alongside the people and not stay abroad, sending 'second-class' fighters to face the Portuguese," Savimbi proclaimed as he denounced Mr Roberto. 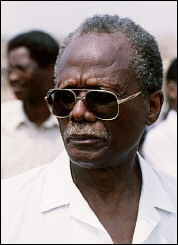 In 1975, an election was held in Angola to herald black rule. Both UNITA and FNLA were defeated by the socialist party, MPLA. from Fidel Castro's Cuba with 15,000 soldiers. The ensuing war for control of Angola saw Mr Roberto's movement suffering heavy defeat; 13 of his men were captured, including Americans and Europeans. They were tried in the capital city of Luanda as war criminals by an international court and three of them were later executed. Following series of failure, relations between Mr Roberto and Mobutu soured and as the war of destabilisation launched against Angola by the apartheid South African government continued, Mr Roberto's FNLA was ignored totally by Pretoria and Washington who heavily backed Savimbi's UNITA. Mr Roberto moved to Paris in 1978, only to return to Angola in 1992 to contest the general elections following the killing of Savimbi and the end of that country’s civil war. The elections marked political and military reconciliation. But the FNLA performed miserably, winning just over two per cent of the vote and five seats in Parliament. The FNLA later broke into two factions and one of Mr Roberto trusted aides, Hendrick Vaal Neto, joined the ruling MPLA Government. A constant critic of the ruling government, Mr Roberto’s health has been waning in recent years and was on the verge of completing his memoir when he died. Holden Roberto; Guerrilla leader. Born on January 12, 1923. Died on August 2, 2007 in Luanda, Angola.